“Growing Desert Plants-From Windowsill to Garden” by Theodore B. Hodoba, published by Red Crane Books in Santa Fe. This book won the Southwest Book Award from the Border Regional Library Association. Hodoba owns a native plant nursery, and is a garden writer. He has published articles in Fine Gardening magazine, and is co-author of “Everybody Needs Trees,” published by the New Mexico Department of Natural Resources. He also teaches a landscaping and gardening course at the University of New Mexico. In the book, he encourages people to buy plants from reputable sources rather than collecting plants from the wild. With beautiful color photos by Charles Mann and botanical drawings by Mimi Camp, this book deals with how to grow the plants, how to propagate them, and how to use them outdoors in a desert garden. The encyclopedia of desert plants contains line drawings, and complete details on over a hundred different plants. Over half of them are cacti and succulents. For each, he provides the Latin and common names, description, range and habitat, and recommended hardiness zones in the U.S. along with details on planting and care. The book contains many helpful lists and charts. There is a list of plants arranged according to their water needs. This will be helpful when gardeners are faced with water restrictions. Other useful charts list hummingbird and other wildlife plants. To make it easy to find common names, there is a chart to use as a cross-reference guide. The maps include a USDA plant hardiness zone map and a map of the Chihuahuan Desert region. Hodoba includes valuable diagrams as well, including ones on pruning and drip irrigation guides. A major part of the book deals with designing a desert landscape with desert species. He provides step-by-step instructions on how this can be done, and gives examples of plot plans, bubble diagrams, and landscape plans. There are sample plans of an island bed and a sand bed. The appendix is very helpful. It contains a list of public gardens where people can view desert plants. There is also a list of mail-order sources for seeds and plants, a glossary of terms, and a helpful bibliography. 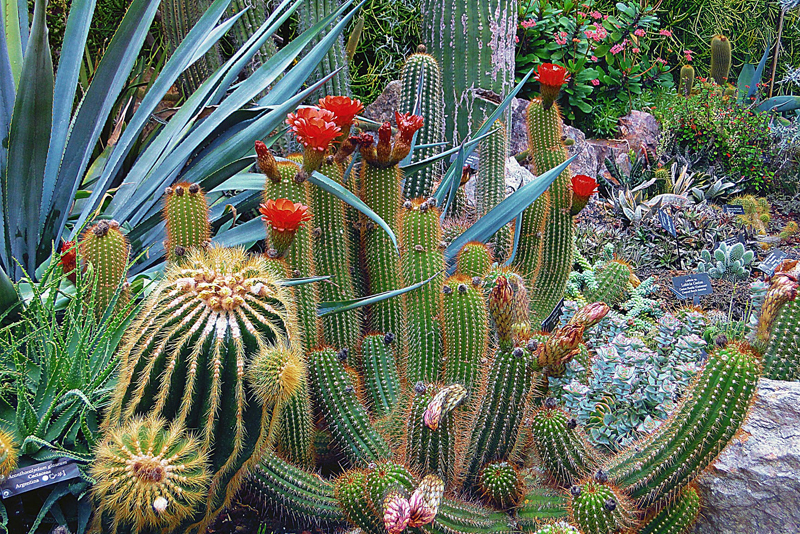 You don’t have to be a desert gardener to use this book. This volume will be very helpful to cactus and succulent growers in other areas as well. He devotes an entire chapter to growing desert plants under non-desert conditions.